Senior Veterinary Officer, Catherine Mann (photo attached), arrived on St Helena on Tuesday, 11 October 2016. Catherine is on a three year contract as the Government Veterinary Officer and traditional vet. Her role is to provide care and treatment for all animals, including the tortoises at Plantation. She will also lead on conducting weekly clinics and farm visits, and performing surgery and artificial insemination. A large part of Catherine’s role is working as the SHG vet which involves, amongst other things, dealing with the import and export of animal products, providing guidance on policy and legislation where appropriate, monitoring welfare and disease threats, and more. “As far back as I can remember, I have always wanted to be a vet, as I love being around animals. 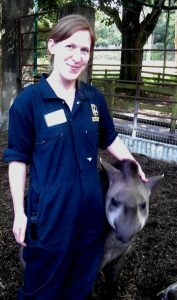 Catherine graduated from Cambridge University in 2009 and since then has been working as a veterinary surgeon. Prior to starting her post on St Helena, Catherine worked at Paignton zoo, working with their giant tortoises, which is likely to have been a useful experience with regards to looking after St Helena’s Jonathan. She was also involved in the control of two avian influenza (bird flu) outbreaks, as well as conducting farm visits and investigations into poisoning and deficiencies. “This experience will no doubt come in handy when looking after Jonathan and his companions at Plantation.